Thomas’ lecture was based off of her and Dr. Ellen Newell’s research into sexism, and how identity and other factors play a role in the actions of women who stand against sexism. “Sexism is pervasive in our society and in the world, it is a huge problem. Sexism is everywhere: poverty, violence, family obligations overwhelmingly affect women and they limit women’s freedom and autonomy,” said Thomas. Thomas introduced this idea through a comic strip, depicting the available costumes for male and female children. Thomas then focused on the lack of representation for women in government and the growing amount of sexual assault and sexism in our nation. She then explained that sexism has both mental and physical consequences for women. Thomas’ solution is to empower young women to have strategies to protect themselves and fight against young women. She reminded the audience that since the 2016 Presidential Election the amount of activism on behalf of women’s rights has grown. She highlighted events like the March on Washington and the #MeToo movement. In her research Thomas looked into what inspires women, and in particular the students here on campus, to rise up and become more politically active. Thomas identified that she researched the material of Paulo Freire, a Brazilian educator and philosopher, who focused on oppression. She agreed that the first steps that Freire states are needed to become politically active are realizing that your social conditions are unjust. How someone does that is by having a critical conscious and being able to have reflection and recognizing problems at hand, Thomas said. This critical consciousness, Thomas states is needed before someone can take critical action. Another needed quality Thomas states is needed is feminism. This idea that being a feminist is an essential component in the women who combat against sexism resonated and stood out to the audience. 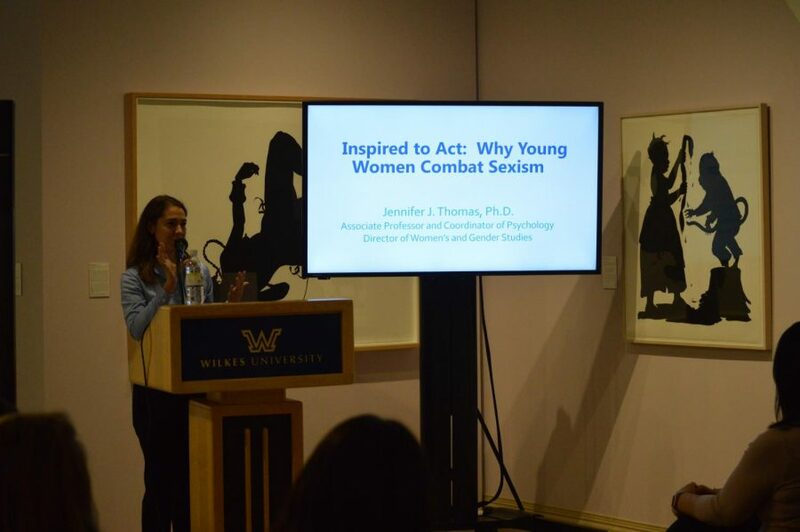 Thomas stated that in her research she found that there was a process that women had to take to become active in taking a stance against sexism. First they have to have critical reflection and understand that they are being oppressed and marginalized. Then they have to identify as a feminist through internal efficacy, the belief that they can make a difference and do something themselves. Thomas found, from her research looking at 420 college women, that women at the college level who engaged in activism had critical reflection, identified as a feminist, and believed they could make a difference. As she closed out her lecture, Thomas gave a call to action for college students to stand up and recognize the problem of sexism and take action in the form of activism. Thomas model was a guideline to show how women most often get to the position of being active against sexism, but can apply to men to, a point she addressed when the audience asked her questions afterwards. Thomas credited both Newell and her students in the women’s and gender studies minor for their help. D’Agostino, Jess Snyder, a senior criminology major, Janelle Sherman, junior psychology and nursing major, and Makayla Sarnosky, a senior psychology major, are all taking Thomas’ class and contributed to her research. Anyone interested in learning more about the topic can look into the women’s and gender studies minor on campus at Wilkes. The next art lecture will be Nov. 7 at 4:30 p.m. and will focus on the art of Elizabeth Catlett.